News Posts matching "Bristol Ridge"
If you're holding out on Windows 7 as your PC gaming platform, you may also want to hold out on your current hardware for a long while. Microsoft is making good on a warning it made earlier this year, that it would not provide support to users of upcoming processors on older Windows operating systems. At their launch, Intel's 7th generation Core "Kaby Lake" processors and AMD "Summit Ridge" and "Bristol Ridge" will receive support from Microsoft only on the Windows 10 operating system. Older Windows versions will not receive drivers from Microsoft that support the new platforms. This is similar to Microsoft cutting off support for Windows XP from Intel's 3rd generation Core "Ivy Bridge" processors. Without platform support, your Windows installation won't utilize many of the CPU features introduced with "Kaby Lake" and "Zen" and will likely run on a bare-minimum compatibility mode. This effectively cuts off PC enthusiasts from using older Windows versions on new hardware, such as the still-popular Windows 7. Non-Microsoft operating systems such as the latest *nix distributions such as ChromeOS, SteamOS, and OS X are still fully compatible with the upcoming chips. At an event last night in San Francisco, AMD provided additional architectural details and a first look at the performance of its next-generation, high-performance "Zen" processor core. 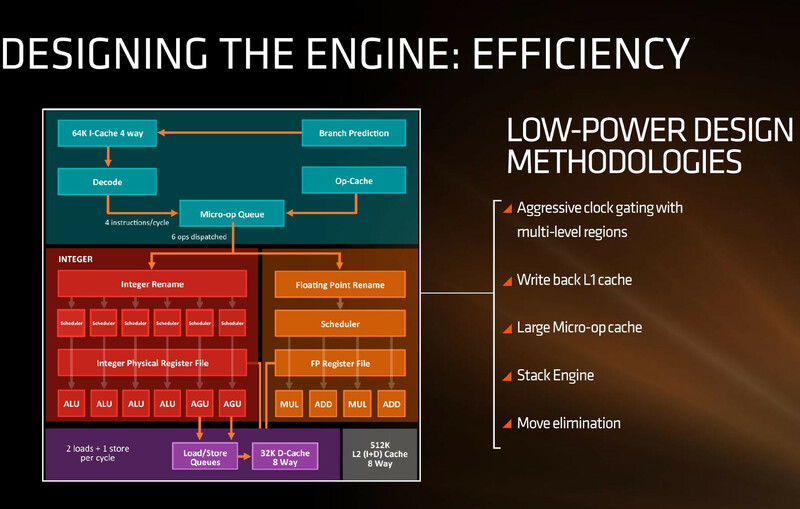 AMD demonstrated the "Zen" core achieving a 40% generational improvement in instructions per clock, delivering a landmark increase in processor performance. 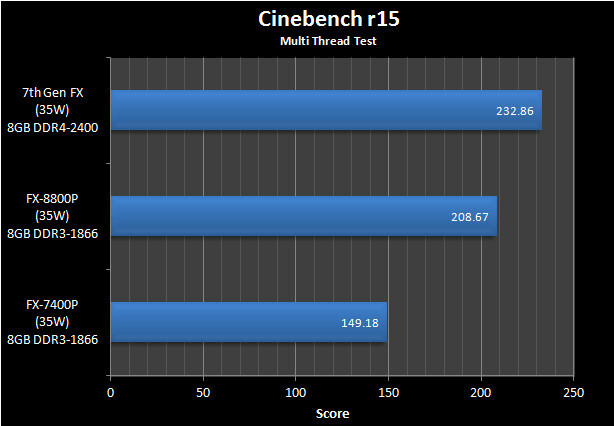 During the event, AMD demonstrated an 8-core, 16-thread "Summit Ridge" desktop processor (featuring AMD's "Zen" core) outperforming a similarly configured 8-core, 16-thread Intel "Broadwell-E" processor when running the multi-threaded Blender rendering software with both CPUs set to the same clock speed. 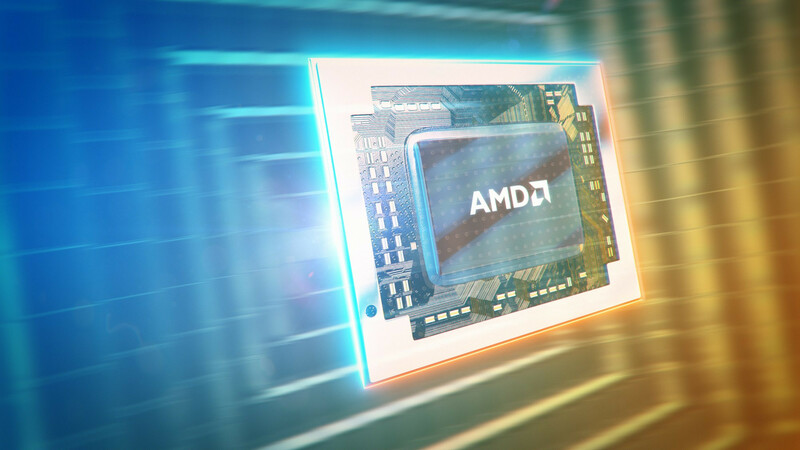 AMD also conducted the first public demonstration of its upcoming 32-core, 64-thread "Zen"-based server processor, codenamed "Naples," in a dual processor server running the Windows Server operating system. AMD "Summit Ridge" Die Pictured? At its 2016 Annual Shareholders Meeting website, AMD reportedly posted a wafer shot of its upcoming 14 nm "Summit Ridge" CPU die. 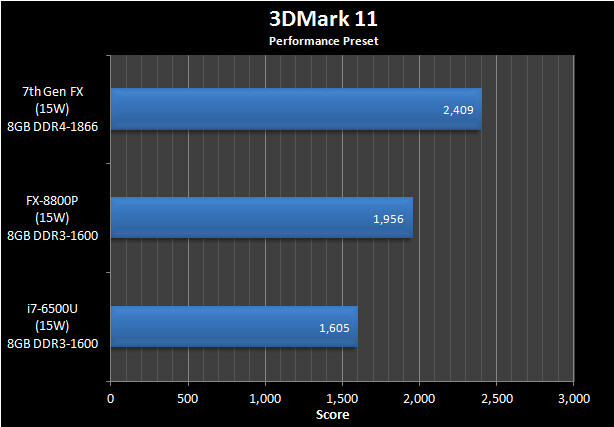 The "Summit Ridge" silicon is rumored to drive a number of performance-thru-enthusiast processor SKUs for AMD. 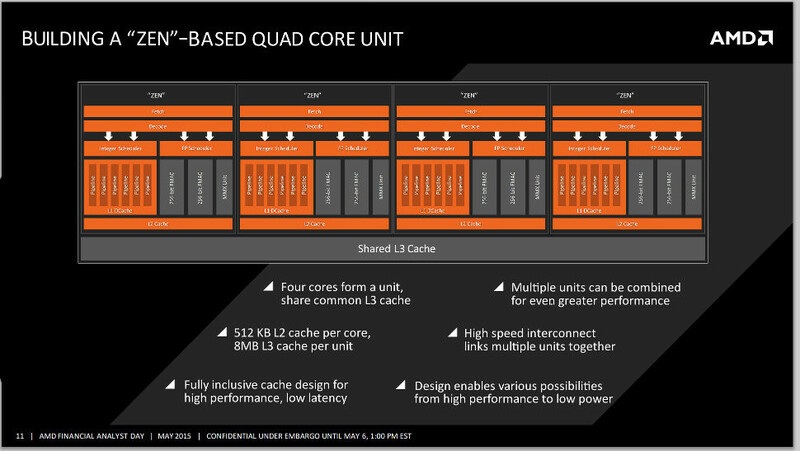 The die pictured features eight CPU cores based on the "Zen" micro-architecture, a dual-channel DDR4 memory controller, 512 KB of L2 cache per core, and 16 MB of shared L3 cache split between two blocks of four CPU cores, each. 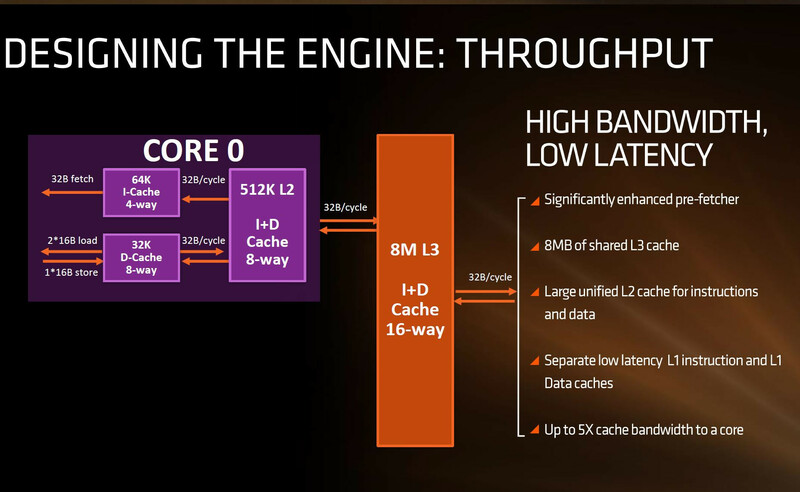 "Summit Ridge," much like the "Bristol Ridge" APU silicon, will be a true SoC, in that it integrates the southbridge on the processor die. 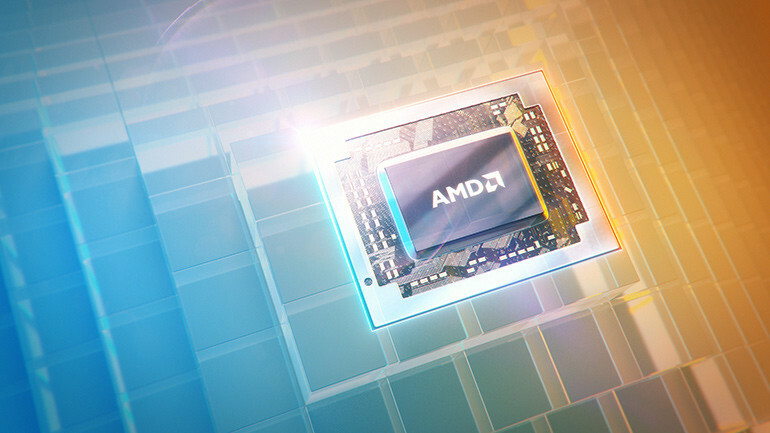 With "Summit Ridge," AMD is also introducing a new inter-socket interconnect replacing its ageing HyperTransport technology. The new Global Memory Interconnect (GMI) bus provides a 100 GB/s path between two sockets. The "Summit Ridge" die features two such interconnect ports. Microsoft, in a tactfully-worded blog post by Exec VP for its Windows and Devices Group, Terry Myerson, announced that it won't support older versions of Windows (eg: Windows 7 and Windows 8.1) on the latest/upcoming processors. The software might run on the new hardware, but the company won't provide enterprise support for such platforms. This could include software updates, as the platform won't technically meet the software's requirements. In the post, Microsoft named upcoming platforms from the big three CPU makers - Intel, AMD, and Qualcomm, to which the company will provide enterprise support only for Windows 10. These include the 7th generation Core "Kaby Lake" processors from Intel, "Bristol Ridge" processors from AMD, and the "8996" SoC from Qualcomm. Machines running a select few models of Core "Skylake" processors will receive enterprise support, but only till 17th July, 2017. After this date, only the most critical security updates will be released for the OS running on those platforms. 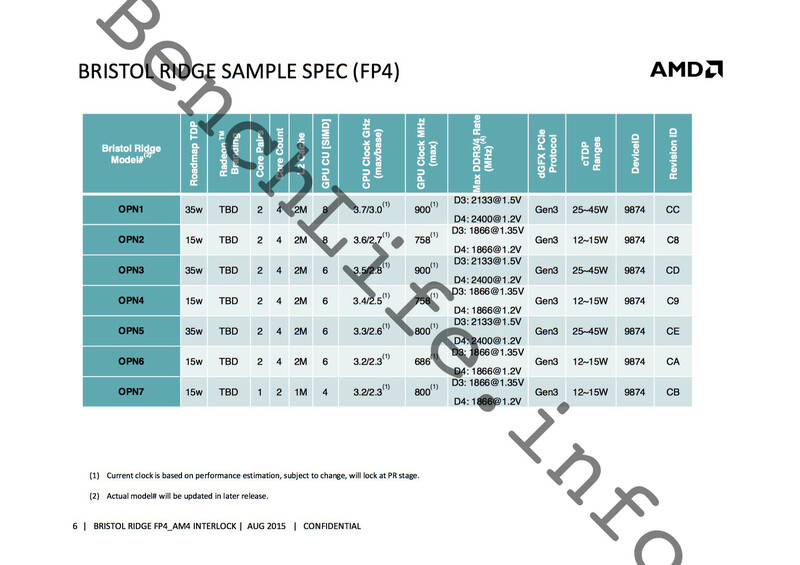 A lot is riding on AMD's upcoming desktop CPU socket, codenamed AM4. 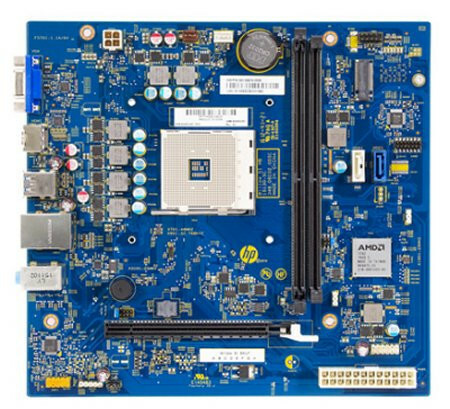 Some of the first motherboards based on this socket are expected to launch in March 2016. 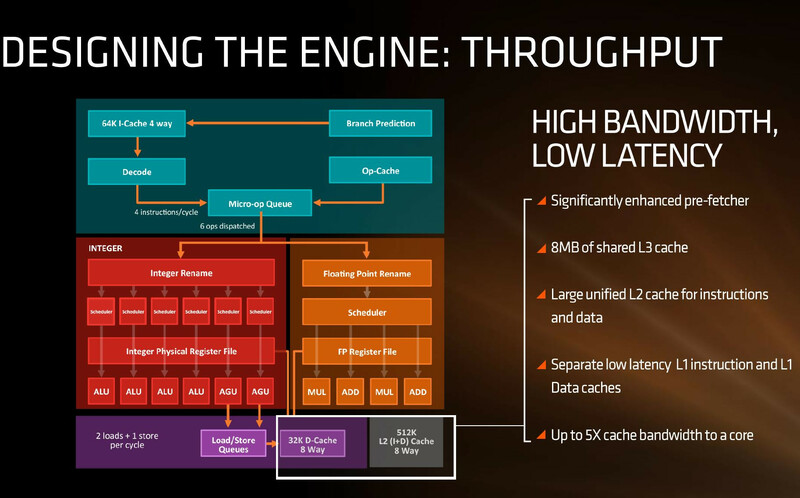 What makes the socket particularly interesting (and important) is that it's a transition point for AMD's two major CPU architecture generations - "Excavator" and "Zen." Excavator is an incremental upgrade of AMD's less than successful "Bulldozer" architecture, while "Zen" is its next major one. 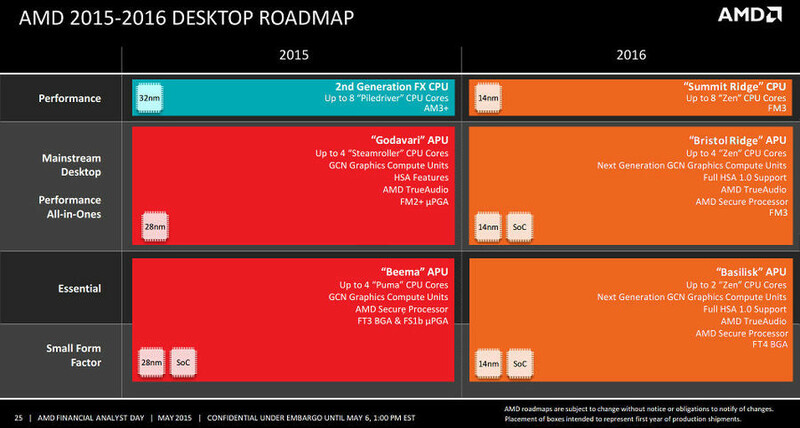 AM4 is also going to be a common socket for AMD's desktop APU and many-core CPUs. 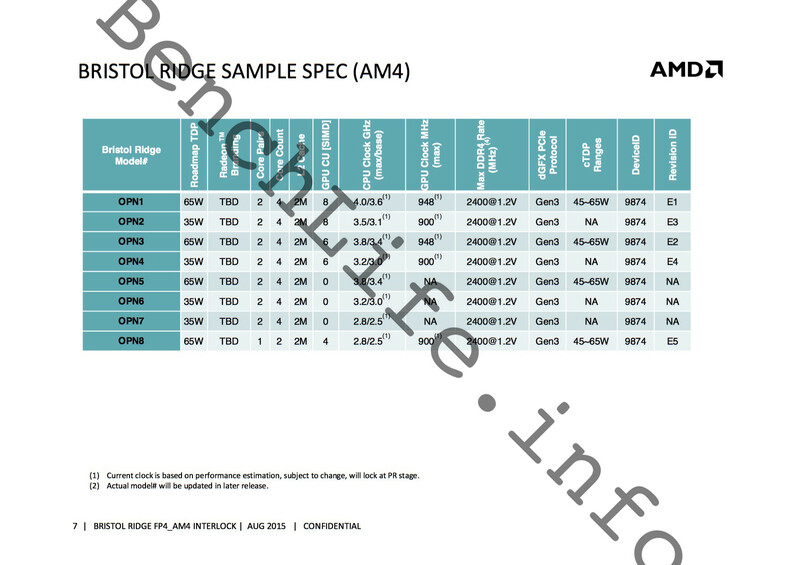 Some of the first socket AM4 APUs could be "Bristol Ridge." Succeeding the company's "Carrizo" APUs, it will be available in both socket AM4, supporting DDR4 memory, and FP4, supporting both DDR3 and DDR4. 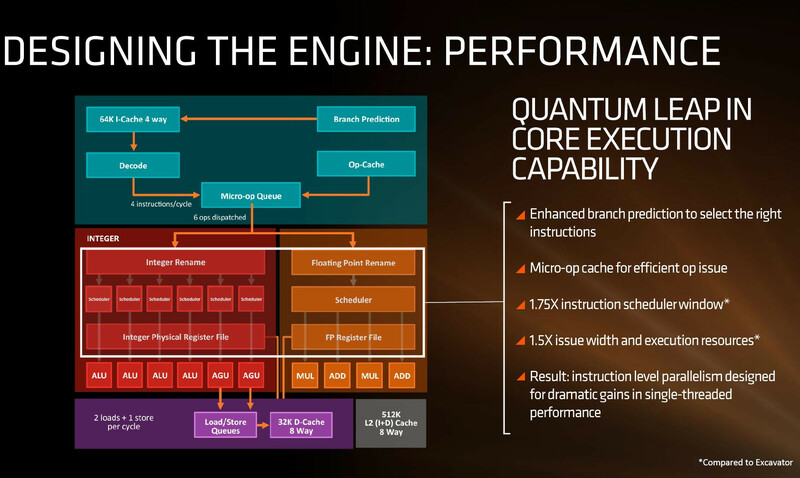 This chip will implement "Excavator" CPU cores. In its AM4 avatar, "Bristol Ridge" will offer up to four CPU cores, with TDP ranging between 45W-65W, and with support for DDR4-2400 memory. 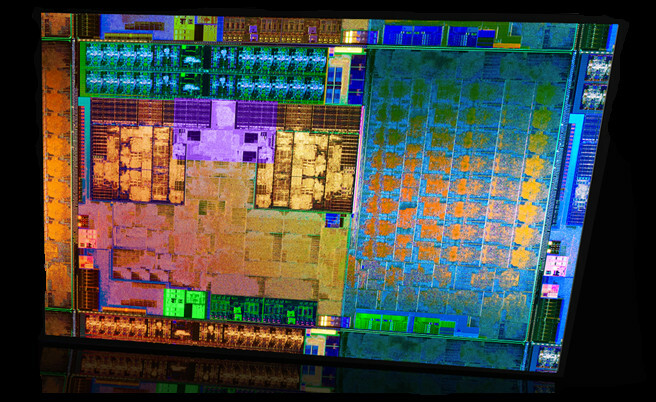 Later in 2016, AMD could debut its first "Zen" multi-core CPUs, which feature the company's next-gen, performance-focused CPU cores. 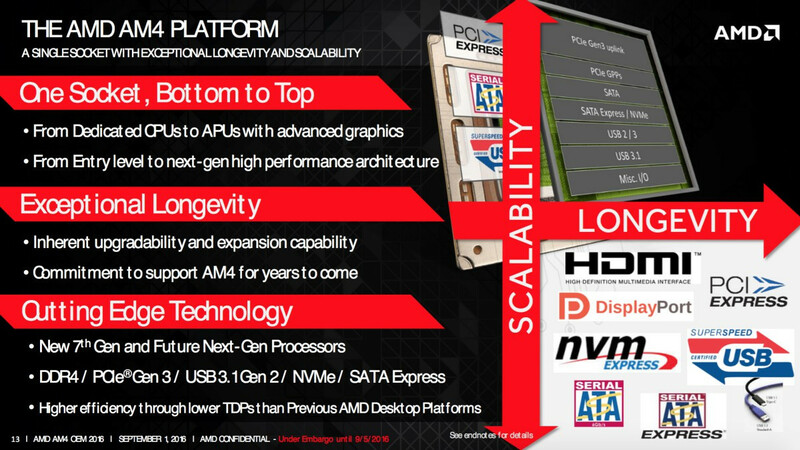 In what is a confirmation that AMD has killed socket AM3+ and its 3-chip platform, a leaked slide that's part of a larger press-deck addressing investors, tells us that the company is planning to launch a high-performance desktop processor targeting enthusiasts, based on its next-generation "Zen" architecture, in 2016. Our older articles detail the Zen CPU core design, and the way in which AMD will build multi-core CPUs with it. 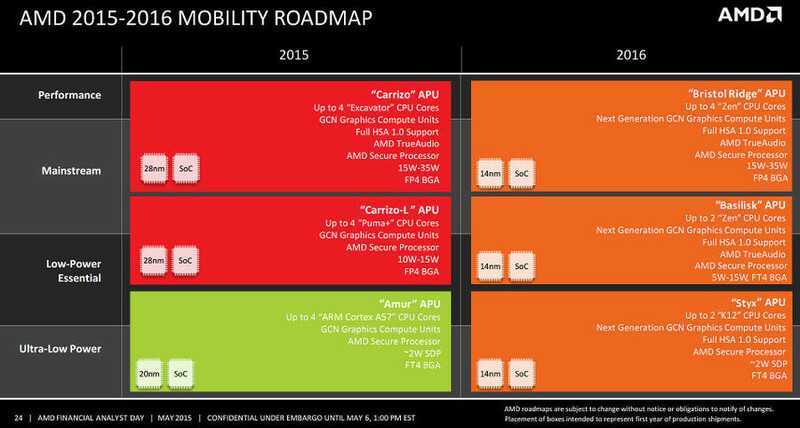 This processor will be codenamed "Summit Ridge," and will be a CPU, and not an APU as previously reported. 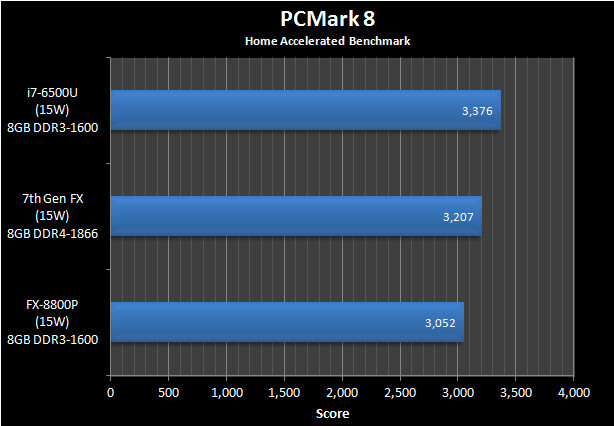 In AMD-speak, what sets a CPU apart from an APU is its lack of integrated graphics. 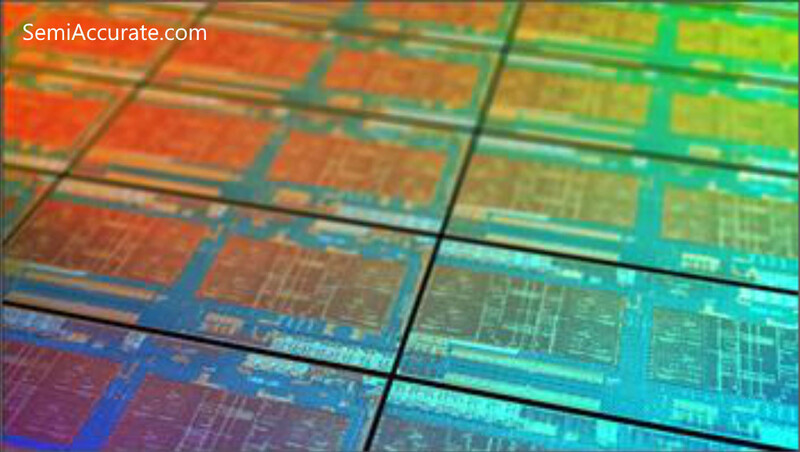 AMD "Summit Ridge" will be an 8-core CPU built on the 14 nanometer silicon fab process. It will feature eight "Zen" cores, with 512 KB of L2 cache per core, 16 MB of L3 cache, with 8 MB shared between two sets of four cores, each; a dual-channel integrated memory controller that likely supports both DDR3 and DDR4 memory types; and an integrated PCI-Express gen 3.0 root complex, with a total of 22 lanes. 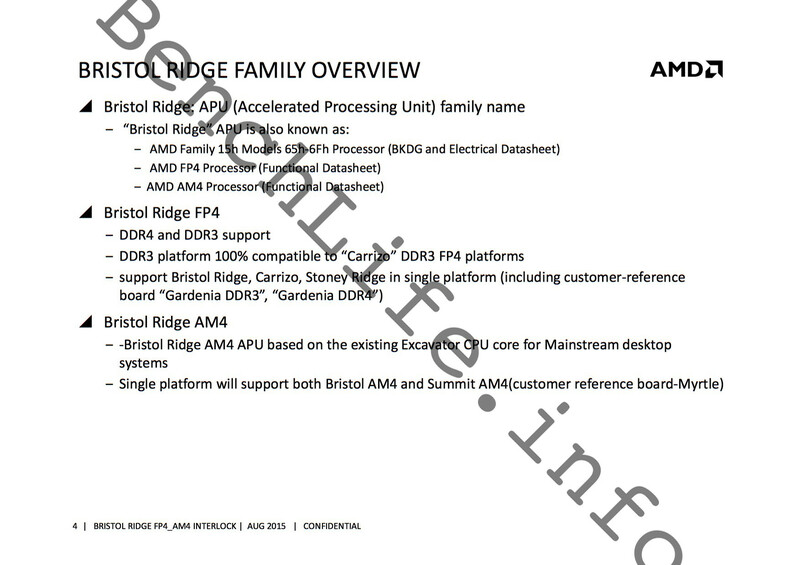 We can deduce this from the fact that "Summit Ridge" will be built in the same upcoming socket FM3 package, which the company's "Bristol Ridge" Zen-based APU will be built on. "Summit Ridge" will hence be more competitive with Intel's 6th generation Core "Skylake" processors, such as the i7-6700K and i5-6600K, than the company's "Broadwell-E" HEDT platform.